Ryan Griffin, Charmaine Morris, Rebecca Heald, Saskia Kent, Marcus Edney, Jim Mora, Lee Hayes, Tasmin Maunder, Stella Foley, Leila Martley, Alice Bayly, Philip Hebert, Aileen Wilkie, Ellen Agger, Debbie Petlueng, Jill Ridgewell & Phill Lang, Georg Peter Mueller, Gautam Singh, Paul France, Barbara Howarth, Yannick Jooris, Geraline Knox, Brian Reay, Katherine Dobson, Peter Kellam, John Hadfield, Peter Hurley, Clare Myers, Karen Seidman, David Williams, Sam Clark, Alison Gentleman, Ian Richardson, Barreira Anne-France, Nat Brown, Evana Belich, Marilyn Harpur, Ceri Dunwell, Martin Archer, Caroline Richards, Toby Philpott, Eddie Fowler, Vanessa Rohan, Johnny Hopper, Laura Summerton, Adam Morris, Yannick Jooris, Rebecca Heald, Karen Seidman. Our Crowdfunding Campaign 2019 ended with $3,405 donated. 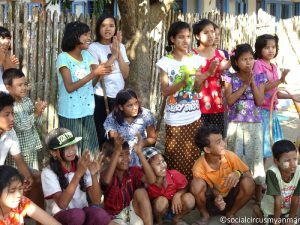 We are engaged in developing Social Circus in Myanmar as a tool for social and personal development for children, youth and young adults. Eden Centre for Disabled Children, filmed Feb 2017.
workshops and small shows in Myanmar as best we can to raise money locally. A Massive thanks to friends and supporters who donated to the Crowdfunding campaign 2019! Social Circus Myanmar is a project to develop social circus in Myanmar. We believe that Social Circus is a useful tool for engaging with children and young adults to support development of their their personal skills, empower them to participate fully in civil society and to spread an agenda of sharing, tolerance, diversity and love through the use of Play and Fun. Our Values: Diversity, Inclusion, Accessibility, Gender Equality, Sharing, Learning through Play and Fun, and Creativity. The goal of this project is to build a framework for a locally-led social circus network in Myanmar which nurtures and empowers disadvantaged children and young adults, and people living with disabilities. Hello, friends of Social circus Myanmar. Anyone in Yangon due to fly to Europe or UK in the next few weeks willing to bring three soft felt juggling hats in their baggage? Weight 1kg total and they take up almost no space. I left them in Yangon by mistake. I'll pay for postage to me in UK once if they can get to Europe. Thanks for any help.